Mange Tout, Mange Tout, my esteemed and honoured guests! 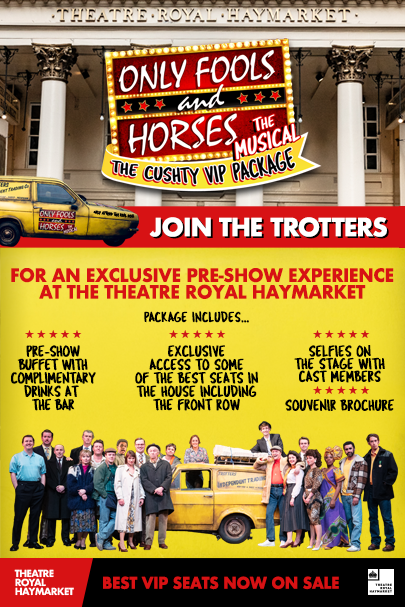 For the first time ever, Trotters Independent Trading Company are unveiling their latest venture – The Cushty Pre-Show VIP Package exclusively at the Theatre Royal Haymarket. Come and savour a slap-up pre-show buffet with drinks included, have selfies on stage with members of the cast and take home a free souvenir brochure. All this, plus best seats to see the smash-hit musical. Lovely jubbly! The Cushty Pre-Show VIP Package is a unique pre-show treat, and perfect for generations both young and old. Don’t be a plonker, be sure to book The Cushty Pre-Show VIP Package including Best Seats to see the musical now. Please note that the length, location and nature of photography opportunities may vary. Cast availability for meet and greet events may vary and cast members who attend may be understudies. The Producers cannot guarantee the appearance of any artist. Food Allergy Disclaimer – Every attempt has been made to identify ingredients that may cause an allergic reaction for those with food allergies. However, there is always risk of contamination using products such as milk, eggs, gluten, nuts etc, we cannot guarantee a total absence of these products in any of our items. A maximum of three drinks per person – beer, Prosecco or a soft drink. No spirits.